The Nesco FS-250 food slicer features a powerful 180 watts motor and a 8.7" stainless steel hardened serrated blade. 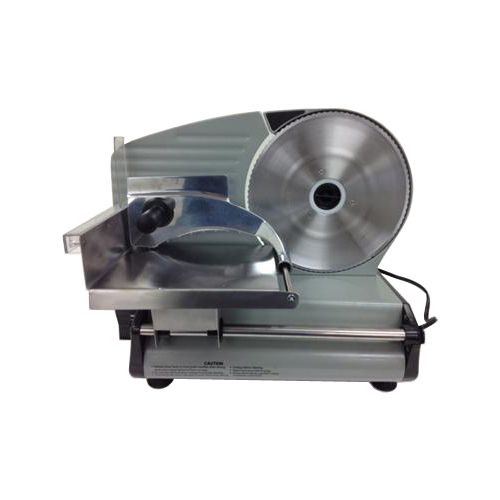 The slicer has a side built-in thickness control knob for 9/16" thickness range. Additionally the slicer features blade guard, quick release for easy cleaning, full stainless steel sliding food carriage and a dual safety feature. The Nesco FS-250 has many exciting features for users of all types. You can extend the lifetime of your Nesco FS-250 with the purchase of a FactoryOutletStore Factory Protection Plan. The Nesco FS-250 is sold as a Brand New Unopened Item.